Description: The monument is composed of a short, rough cut block of granite approximately four feet wide by two feet tall, with an inscription carved into a smooth rectangular area. Unveiling & Dedication: Mrs. Newcombe, president of the North Carolina War Mothers, introduced the monument, and an address was given by Colonel William T. Joyner. A prayer was offered by Dr. James B. Turner who served as chaplain for the the 120th Infantry of the 30th Division and officiated at the burial of 349 soldiers who lost their lives in the Battle of Bullecourt. Subject notes: The monument commemorates the soldiers in the United States Army's 30th Division who fought and died in World War I. The 30th Division was given the nickname "Old Hickory" in honor of Andrew Jackson. Jackson received the nickname as a reflection of his tenacious and unyielding nature. The monument dedicated the old NC Highway 10 to the 30th Division. 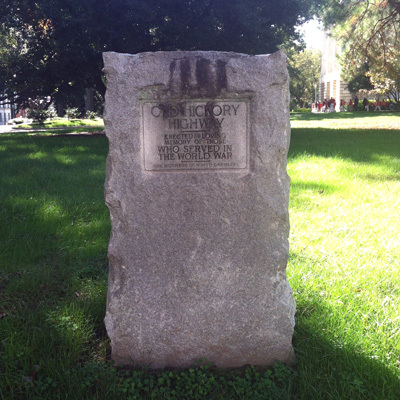 Location: The monument sits off the sidewalk on the northeast corner of the Capitol grounds on Edenton Street, just past the intersection with Wilmington Street. Landscape: The monument sits on the lawn near mature shade trees.